Hello again conquering capsuleers! This is CCP Fozzie bringing you a dev blog covering our plans for an upcoming rework of Nullsec Sovereignty. I know that a lot of you have been eagerly awaiting details on these plans and I’m very excited to show you all what we have been working on and start receiving feedback from the wider community. This is going to be a very long dev blog, but we here at CCP believe that Sov is a big deal that deserves to be discussed thoroughly. I have written a status update blog looking back on Phase One of our Nullsec changes (which released in Phoebe last November) and how they have impacted the game. You can find that blog here, but for the lazy people the TL:DR is that the results are looking quite positive so far and those Phoebe changes put us in a much stronger position from which to launch Phase Two. This blog will cover the changes we are currently working for Phase Two of the Nullsec and Sov revamp. We’ll discuss the goals of the design, the new mechanics being created to reach those goals, and go over an example Sovereignty conflict to illustrate the flow of the new system. We know that when changing a system as complex and competitive as Nullsec Sovereignty, it is very important to provide adequate time to incorporate feedback and get the changes right. We have been discussing these designs in detail with the Council of Stellar Management for a little over a month now and we are releasing these dev blogs early so that we can get the crucial public feedback process started as soon as possible. Our current plan is to release Phase Two of the Nullsec and Sovereignty revamp in June 2015. We’ll be listening and working closely with the community from now until then to incorporate feedback and ensure that the changes we release represent the best possible update to Sovereignty gameplay. Of course like everything in game development, these dates are open to change and we’ll be taking full advantage of our rapid release schedule to ensure that these changes are released as soon as they are ready. I’m sure many of you are already skipping down to look at the new mechanics, but before we talk about implementation I think it’s important to review the clearly defined goals our game design team had for the new system. This goal forms the core of what we want to accomplish with Phase Two. We have released many changes over the past few years that have focused on Nullsec income, industry and resources, and those changes have been very successful. However the gameplay surrounding conquering and defending space has not changed significantly since 2009 and this is the area where we see the most opportunity for improvement. It’s absolutely key that Sovereignty warfare provide exciting gameplay and opportunities for significant contributions by all the players involved. Players from coalition leaders to line members and everyone in between should be able to look forward to the gameplay surrounding defending their home or invading their neighbors. We hope to achieve this goal by rebuilding EVE’s Sov warfare mechanics to emphasize the best aspects such as strategic planning, empire building and dynamic PVP engagements, while minimizing the less exciting parts of the gameplay. We are well aware that Nullsec empires have mastered the strategy of weaponizing their opponent’s boredom, so our new system must be built around a core of engaging competitive gameplay. It is vital that the core mechanics involved in taking space be easily understood and flow logically. The best multiplayer game systems involve simple mechanics that combine with competing player interests to generate complex and unpredictable results. Sovereignty must be one of these systems. We hope to achieve this goal by focusing on an easily understood core game system that encourages player interaction and conflict. Unlike the Dominion Sovereignty system with its intertwined structures and states, the different structures in our new Sovereignty system operate independently to keep each structure simple and to give players freedom to choose their own priorities. One major flaw of the current Dominion Sovereignty system is that the use of structure hitpoint grinding forces players to use huge numbers of players or colossal capital ships to fight over space, even when they would otherwise prefer to work in smaller units. This also creates an artificial floor on the size of alliances or coalitions that can be successful in Sovereignty. A new Sovereignty system should not attempt to artificially determine the size of groups that can operate within it, either by forcing larger fleets or by forcing smaller ones. Instead, players should be able to work with numbers of friends that they consider appropriate for the situation. Rather than trying to enforce some arbitrary limit on how many friends or allies you have, this system is simply designed to give organizations and players more freedom to choose the size of coalition that they prefer. Bringing more players will always have some value, as it will provide advantages in direct fleet combat with your opponents. But a system that allows small numbers of players to conquer space as quickly as larger numbers ensures that if your fleet has the capability to win the fight, you automatically have enough people to take the Sovereignty objectives. Directly following from the goal above, it’s extremely important that we minimize the total player-hours required to take undefended and/or unoccupied space. The large time investment required to grind structure hitpoints under the current system allows alliances to effectively use fallow space as buffer zones and to wear down the will of an opponent through sheer boredom. With our new system we intend to reach this goal by tying the defense of Sovereignty directly to the actions of players, through both combat fleets during attacks and active residency gameplay in peacetime. Our realistic goal for the new Sovereignty system is that a very small group of players in virtually any ship types should be able to completely conquer an undefended system with a few ~10-30 minute sessions spread across a few days. On the other hand, evicting an alliance that actively uses and defends their space should be a very difficult task indeed, which leads us to the next goal. It’s very important that active and prepared alliances be provided with the tools they need to defend their homes. Providing benefits for robust in-space activity has been one of the key drivers of many of the economic changes to Nullsec over the past few years, and those changes have been quite successful in shifting the focus of Nullsec economic activity from static assets to bottom-up gameplay. It’s now time to begin linking this same bottom-up economic activity more strongly with the world of strategic Sovereignty warfare. In the new Sovereignty, systems full of active occupants will be vastly easier to defend and control than abandoned ones, bustling empires with a variety of activities will be stronger than AFK ones, and disrupting your enemies everyday activities in their space will help you gain advantages both strategic and economic. More details on how we intend to begin achieving this goal will be discussed later in this blog. By spreading objectives across multiple star systems we can provide unique tactical choices tied to the layout of individual constellations. 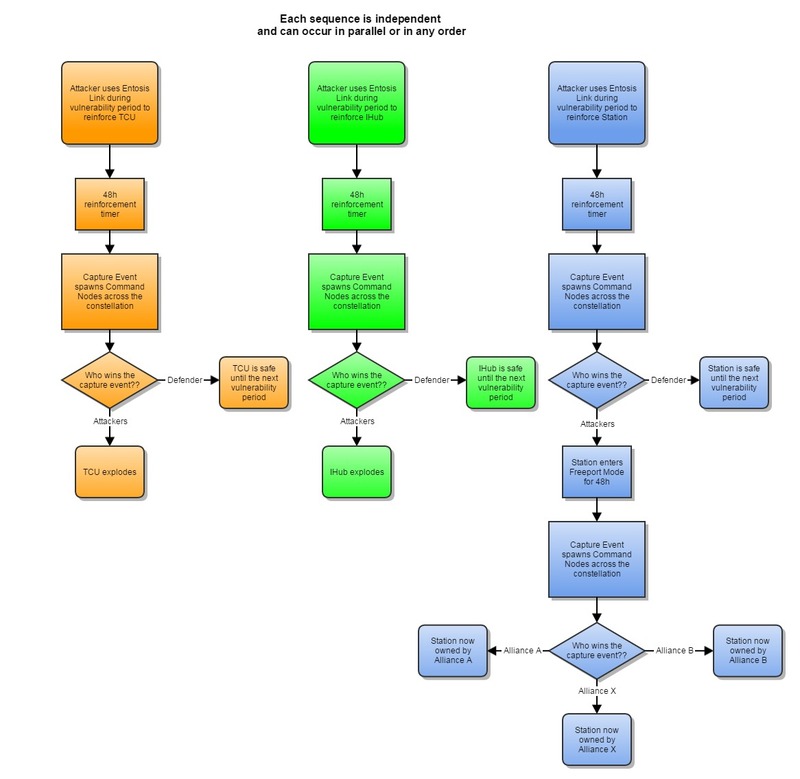 This should help ensure variety and enable more dynamic engagements. 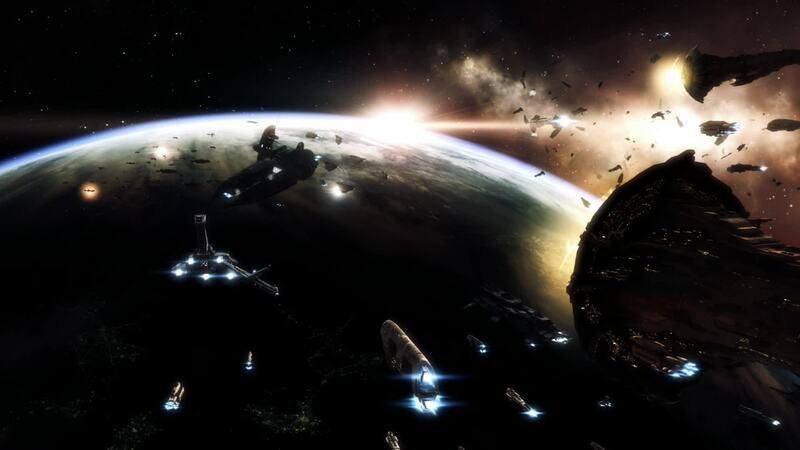 Huge clashes between empires have become one of the most iconic symbols of EVE’s uniqueness and a source of well-deserved renown both for the game itself and for the fleet commanders who lead these battles. However anyone who has experienced these events firsthand will tell you that user experience suffers under the technical realities of battles containing such massive numbers of players. For the last 12 years, CCP has combined top-shelf hardware with innovative software techniques to fit more players on one star system than anyone ever imagined would be possible, and more advancements in both Tranquility’s server hardware and EVE’s codebase are in the works to push the envelope even further. However we must face the reality that player numbers will always outstrip our ability to increase server capacity. When we made 500 player battles smooth, alliances started bringing 1000. When we made 1000 player battles smooth (on reinforced nodes), 4000 of you folks decided to show up at once. This means that we need to do everything we can through design to spread battles out into multiple smaller simultaneous engagements which should each perform more smoothly. We are not under the illusion that some theoretical perfect Sovereignty system would ever be able to stand the test of time without changing. Sovereignty gameplay is the most ruthlessly optimized part of EVE and will always need to be adjusted and updated regularly to remain fresh. It’s also important that our new Sovereignty system be flexible enough to incorporate new improvements to EVE as they are released, especially improvements to structure gameplay that are being developed as we speak. The possibilities for engaging gameplay provided by the combination of complete revamps to Sovereignty and structures are nearly endless. To reach this goal, new Sovereignty is being designed to be as modular and flexible as possible. We have intentionally built many aspects of the new system that can be easily adjusted and tweaked. This will allow us to incorporate the feedback from the community before release, respond to problems or stagnation after release, and replace specific parts of the design with new types of gameplay as they are released in the future. You’ll see a great many numbers, durations and percentages in the rest of the blog, and it’s important to remember that they’re all open for adjustment. All right, let’s start discussing what we’ve been working on. We’ll cover five key design features of the new system, then introduce some of the new work-in-progress UI elements and end with a walkthrough of a hypothetical battle over a star system to demonstrate how the elements all come together. We’ll begin by introducing a new module that sits at the core of the new system, and that will become more and more important to many parts of EVE over the upcoming months and years. Recently mysterious new ships have been spotted all across New Eden, sporting advanced technology unlike anything seen before. Exploring the recovered wreckage of these Drifter battleships, researchers are already starting to make startling breakthroughs in the field of mind-machine interfacing. One of the first results of these breakthroughs is a new module that enables capsuleers to directly interface with the computer systems governing certain structures, bypassing the need for abstracted hacking interfaces. The Entosis Link module represents the central interaction mechanic of the new Sovereignty system (among its other uses) and the interaction between competing groups of players wishing to use their Entosis Links will provide much of the gameplay and conflict. The Entosis Link is a targeted highslot module that can be activated on certain structures. For the purpose of this Sovereignty redesign, the important targets are Territorial Claim Units, Infrastructure Hubs, Stations and Station Services. The Entosis Link is used for all kinds of manipulation of these structures. In general, activating an Entosis Link on a structure you own will activate and protect it, while activating an Entosis Link on a structure you do not own will disable, reinforce or capture it. Crucially, the process of exerting control over a structure using an Entosis Link cannot be sped up by using more links or more players. If two or more Entosis Links belonging to different “sides” are operational on the same structure at the same time, neither will have any effect and all capture will be paused. This remains true even if one side has more Links operational on the structure than the other side. If the structure has a current owner, then the alliance that owns the structure is one side and everyone else in EVE is the other side as far as the server is concerned. All Entosis links from any alliance other than the owning alliance are considered to be the same side. This means that in fights over an owned structure, allies of the owner can provide support by shooting other players but if those allies activate their own Entosis links they will not pause enemy capture progress or do anything to return the structure to its owner’s control. This ensures that a defending alliance must show up personally to at least help with the defense of their territory, no matter how strong their allies are. If the structure has no current owner, then every alliance represents their own team and any two separate alliances running their own active Entosis links will pause capture. This power doesn’t come without risks however. Entosis Links have a significant cycle time (5 minutes for the Tech One variant, 2 minutes for Tech Two) and do not start affecting the battle for control of the target structure until the end of their first cycle. Activating an Entosis Link also causes ships to become extremely vulnerable for the duration of the module’s cycle: the equipped ship cannot warp, dock, jump or receive remote assistance until the cycle completes. Requires the skill Infomorph Psychology (rank 1 skill). Low fitting requirements, uses high power slot. Only one may be fitted per ship. Cannot be used by trial accounts. Maximum range of 25km for Tech One, 250km for Tech Two. Requires a target lock on the structure. Capital Ships would have restrictions for using these modules, most likely in the form of a role bonus that increases the cycle time by 400% (this means a 10 minute cycle time for a T2 Entosis Link on a capital ship). A clear visual effect shows which ships are applying Entosis Links. Build costs of approximately 20 million isk for Tech One, and approximately 80 million isk for Tech Two. The cycle time of Entosis links does not affect the speed at which structures are captured once the first cycle is complete. This means that using a T1 Link will cause a longer initial delay before capturing begins (during the first cycle) and will leave the player vulnerable and unable to warp for longer periods of time, but will still capture the structure in the same amount of time as a T2 link once it’s up and running. Both the cycle time of the Entosis Link module and the actual capture process will be affected by time dilation. When a target structure does not have a current owner, every alliance represents their own “side” and all characters are capable of making progress towards capturing it at the same rate. When a target Sovereignty structure has a current owner, the system recognizes two sides (the current owning alliance on one side and everyone else on the other) and the rate at which attacking characters make capture progress is reduced according to the occupancy defensive bonuses of the solar system. More details about how these bonuses work will be explained later in the blog. This means that Entosis Linking will replace shooting of structures in every part of the Sovereignty system. After the June release, shooting of structures will not play any part in Sovereignty. Before occupancy defensive bonuses are applied, exerting uncontested control over Territorial Claim Units, Infrastructure Hubs and Outposts will take 10 minutes (plus the duration of the first cycle) and enabling/disabling station services will take 5 minutes (plus the duration of the first cycle). Like everything in this plan, these numbers are subject to change based on playtesting and discussion. The Entosis Link will be added to the game about a month before the launch of this Sovereignty system to allow players adequate time to manufacture stockpiles. This basic Entosis Link gameplay is used repeatedly throughout the Sovereignty capture and defense gameplay, so it’s worth making sure you’ve fully read the previous section before moving forward. Under the new Sovereignty system, each of the three key Sovereignty structures (Territorial Claim Unit, Infrastructure Hub, and Station) will all exist and operate independently from each other. They will have their own separate functions and there will no longer be any requirement for the same alliance to own all three (in practice however, they will often end up owned by the same alliance). Under this new system, only one of each Sovereignty structure can exist in the same system at the same time. This structure will be distilled down to its core function: a declaration to the whole of New Eden that you lay claim to a particular system and that you intend to defend that claim. The TCU will no longer have an upkeep cost (this cost will be split between the IHub and Station) and will not be required in order to operate the other Sovereignty structures. The benefits of this structure will be registration into the Sovereignty filters on the map, your alliance logo visible to every pilot in the system and the existing 25% bonus to starbase fuel use. By removing the upkeep cost from TCUs and keeping their affordable cost, we will ensure an affordable entry level option for alliances interested in dipping their toes into Sovereignty. Since we are no longer forcing alliances to use a TCU in order to anchor and protect IHubs and Stations, the value of TCUs will now be able to be set entirely by the goals and aspirations of each alliance. You will also no longer need a TCU in order to gain the benefits of Infrastructure Hub upgrades. How much value your alliance places on defending its TCUs can depend entirely on your own priorities. The Infrastructure Hub will continue to enable system indices and provide a location for the installation of system upgrades so that alliances can improve their space. The Infrastructure Hub will now have a base upkeep cost and the Strategic Sovereignty Index will now be obtained by keeping an IHub alive in a system rather than being obtained from the TCU. Future iterations on this system will add more structures that alliances can use to obtain new kinds of bonuses and effects in their space. Stations will continue to provide all the services you know and love, including docking, fitting, refining, industry and markets. Station services will now be enabled and disabled through the Entosis Link mechanic rather than shooting through hitpoints. To disable a station service, anyone other than the alliance that owns the station must apply an Entosis link directly to the targetable station service. The capture mechanic for station services is exactly the same as for any other structure, except that station services activate and deactivate in half the time that Sov structures reinforce or capture. To enable a station service again, any member of the alliance that owns the station must apply their own Entosis link directly to the targetable station service. Multiple station services may be disabled at the same time by multiple ships with their own active Entosis links. Neither DPS nor remote reps will be used for controlling station services in the new system. Stations will now have part of the Sovereignty upkeep cost that was previously attached to the TCU. Sovereignty Blockade Units are not needed as part of this new system and will be phased out, leaving us with three key structures instead of four. The existing stock of SBUs and their blueprints will be removed, with compensation to their owners. In the new Sovereignty system, each alliance will designate a four hour window through a new option available in the Corporation Management window to certain members of the alliance executor corp. This period will represent the alliance’s declared prime time, and will be visible in the show info window for the alliance and in the show info window for each Sovereignty structure belonging to that alliance. When an alliance changes their prime time window, their new choice will not take effect until after 96 hours have passed. At the end of this 96 hour waiting period all the structures belonging to that alliance will be vulnerable twice in the same 24 hour period (one in the old window and once in the new one). The new setting will then take effect and become the new daily vulnerability window. This will determine the time period within which all Sovereignty structures belonging to that alliance are vulnerable to be reinforced, and the time period within which the exit time of all reinforcement periods for that alliance’s Sovereignty structures will be randomly selected. All Sovereignty structures belonging to the alliance will become vulnerable to be reinforced during that same four hour period every day, except for days when those structures are in the middle of a reinforcement period. This allows alliances to ensure that they can defend their structures both from initial attacks and in subsequent Capture Events through active combat in their most important time zone. The fact that all structures belonging to the same alliance will be vulnerable during the same period of time allows more localized attackers to receive an advantage over a more widely spread defender since the defender will need to respond to attacks anywhere in their territory. During the vulnerability period any character can activate an Entosis Link on the Sovereignty structures to begin the process of reinforcing it. Once the first cycle of the Entosis Link completes and the capture progress begins the Alliance who owns the structure will be notified of the attack and will need to respond in order to prevent the attackers from reinforcing the structure. Reinforcing a Sovereignty structure with the Entosis Link will take anywhere between 10 minutes and 40 minutes of uncontested capture, depending on the level of occupancy defense bonuses in the system. If the attackers are successful in completing the capture progress, the structure will pick a random time within the same prime time window two days later, and enter reinforced mode until then. 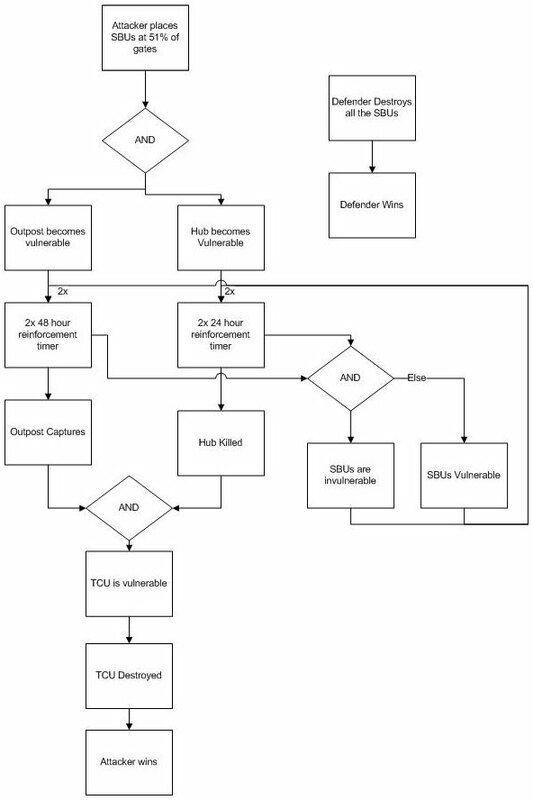 If a structure is partially captured at the end of the vulnerability window, it will remain vulnerable until it is either captured and enters reinforced mode or is returned to full owner control by the owning alliance using their own Entosis links. Although reinforcing of Sovereignty structures may only occur during the owning alliance’s prime time window, station services can be disabled at any time through use of the Entosis Link for between 5 and 20 minutes (depending on occupancy levels). When Sovereignty structures exit their reinforcement period approximately 48 hours after the initial attack, they spark the beginning of a new capture event in which players fight over Command Node anomalies that spawn at random points throughout the constellation. These Nodes have an equal chance to appear in any system in the constellation, regardless of who owns the Sovereignty in the other systems. These Command Nodes will be visible through the anomaly scanner, sensor overlay and overview, and will be clearly named after the structure that they apply to. Capturing a Command Node follows exactly the same process as reinforcing a structure, with players competing to make progress towards capture by applying Entosis Links to the Command Node structure. When an Alliance captures any individual Command Node, they will gain progress in the constellation-wide tug of war for that structure. Multiple capture events can occur simultaneously in the same constellation if more than one Sovereignty structure within that constellation exits their reinforcement periods in close succession. In that case each event operates independently of the others and the tug of war for one structure has no effect on the tug of war for any other structures. If the Sovereignty structure exiting its reinforcement period has an owner, then occupancy defense bonuses apply to all of the Command Nodes for that structure’s event. The level of the occupancy defense bonuses are determined by the occupancy indices in the system containing the reinforced structure (at the time of initial reinforcement), not the system containing the individual Command Nodes. More details about the occupancy defense bonuses can be found later in the blog. Immediately as the structure exits its reinforcement period, five Command Nodes will spawn at random points throughout the constellation. More than one Command Nodes can potentially spawn in the same system. As soon as each Command Node is captured, a new Command Node will spawn somewhere else in the constellation. In addition, as time passes extra Command Nodes beyond the initial five have a chance to spawn and capturing those Nodes will also spawn new Nodes instantly. This ensures that if a capture event starts running long it becomes easier and easier for it to reach a resolution and for any stalemates to break. If one side is allowed to capture the Command Nodes uncontested, then capturing 10 nodes will be enough to win the event. This means that it will be possible for a defender with no opposition and at least five active pilots to complete the event and secure their structure in less than 30 minutes of capturing. This minimum time would also be possible for a small group of aggressors who are attacking an undefended solar system with no occupancy indices. If nobody shows up to defend or attack a capture event, or if the involved parties are perfectly matched, the event can go on indefinitely. The addition of new Command Nodes to the event over time makes stalemates extremely unstable over time however. If downtime occurs while a capture event is active, it will save its state and continue as normal after downtime. The expected flow of a battle over a capture event will vary greatly depending on the landscape of the constellation, the size and strength of the involved parties and the skill of opposing fleet commanders and pilots. Both attackers and defenders will need to split their forces and stay mobile to be effective, which should encourage a fluid battle as well as providing more opportunities for newer fleet commanders and leaders to step up without needing to run a whole fleet. Defenders with high levels of activity will be able to use their occupancy defense bonuses to great effect in these battles, as they will be capturing Command Nodes up to 4x as fast as their opponents. Defenders will also often enjoy the benefits of jump bridges, starbases, stations and other infrastructure spread throughout the constellation. The nature of the Entosis Link gameplay combined with these events should create strong opportunities for enjoyable and fluid fleet combat, rather than the largely static nature of current set piece Sovereignty battles. We see a huge potential for varied and enjoyable gameplay in this new capture event system, and it’s very exciting to once again have constellation geography matter in a significant way to combat in EVE. The variety of constellation layouts throughout Nullsec is something that is often overlooked since the current Sovereignty system largely ignores it. Each constellation has its own chokepoints, key systems and unique movement patterns. As a hint of what’s possible, take a look at the following images of different constellation geography as viewed from Dotlan. All of these constellations are from one Nullsec region (Providence) and each one of them would provide a completely different tactical environment. In a capture event for a structure with an owner, the system considers every member of the owning alliance to be defenders and every other player to be attackers. This means that if you wish to support your allies in another alliance in defending their structures you may do so by engaging their enemies in combat but if you apply your own Entosis Link to the Command Nodes you will contribute to the attacker side instead of the defender. In this way, we ensure that although allies in other alliances can be a huge help when defending space, a successful defense does require at least some active presence from members of the structure owning alliance. When one side wins the capture event, all remaining Command Nodes for that event will go inert and despawn. If the defender wins a capture event for one of their owned structures, the structure becomes invulnerable until it becomes vulnerable during their alliance prime time the next day. It does not need to be repaired in any way. If the attackers win a capture event for a Territorial Claim Unit or Infrastructure Hub, then the structure explodes and any alliance will be free to attempt deploying of their own replacement structures. However if the attackers win a capture event for an owned Station, it will enter a new Freeport Mode for another 48 hours and when it exits from that timer it will be available for capture by any alliance through a free for all capture event. Stations will enter a mandatory 48 hour Freeport Mode and second reinforcement period if their owners lose a capture event for them. While in this mode, the Station is not owned by any alliance and all players are able to dock and use the services of the station. No players will be able to change any settings for the Station during this time period, and no fees or taxes will be awarded to any corporations. No docking fees may be charged. Freeport Mode stations will be clearly visible on the map and the timer for when they will exit the second reinforcement period will be visible in their show info window. When a station exits this second reinforcement timer, another capture event begins with a twist. Since the station has no owning alliance, no occupancy defense bonuses will apply to anyone capturing the Command Nodes. As well, unlike the standard capture events where the two sides are the defender and attackers, the capture event for a Freeport Mode station pits each individual alliance against each other in a free for all multi-side tug of war. Only one alliance can capture each Command Node, and each of those successful captures gives that specific alliance points towards the larger tug of war. The station remains in Freeport Mode for the duration of this second capture event, so any pilot may dock and make use of the station during the fighting. Whichever alliance wins this tug of war for the second capture event (it could be the old Station owners, the alliance that attacked in the first place, or a third party) takes ownership of the Station at that point. The Station would then become invulnerable until the next occurrence of this winning alliance’s prime time period. The term occupancy Sov has taken a peculiar place in the EVE community’s consciousness over the last year or so. It has become incredibly popular, partially because it makes an excellent box within which the speaker can place all their hopes and preferences for the future of Nullsec. We could easily find hundreds of players who would advocate for occupancy Sov, but when we dig deeper we discover that many of those players are imagining completely different mechanics. It’s for this reason that I hesitate to assign the label of “occupancy Sov” to this plan, as there is no single plan that could reflect each player’s personal vision of “occupancy Sov”. However there are some important qualities at the center of the occupancy groundswell that are extremely valuable and belong in our next Sovereignty system. For the first release of this new Sovereignty system, we will be working towards these goals by tying the existing system indices to a new occupancy defensive bonus that slows the structure capture rate of all attackers. Just like in the current Sovereignty system, the Military Index is obtained by killing NPCs in the system and the Industrial Index is obtained by mining in the system. The Strategic Index, which is currently tied to the lifetime of the TCU structure, will be tied to the lifetime of the IHub instead. The bonus provided by the Military and Industrial indices are 150% stronger than those provided by equivalent levels of the Strategic Index. This is intentionally designed to provide a larger incentive for active occupancy than for simple duration of system control. This defensive bonus will apply to all Sovereignty structures that have a current owner and are in a star system with any indices above 0, as well as Command Nodes for those structures (no matter what system the Command Nodes are physically located). The basic mechanics of the Entosis Link remain the same (no benefit beyond the first module, two opposing modules pause all capture) but when anyone other than the owner of the base structure is making capture progress that progress will be slower. To determine the full bonus applied to each owned structure, find the appropriate value of your current level in each of the three indices and add them together, then add 1. The speed at which attackers reinforce or capture structures or command nodes is then divided by that result. For a fully maxed out system, this occupancy bonus would divide enemy capture speed by 4 (causing them to require 4x as much time to capture or reinforce a structure or service). This system of occupancy defensive bonuses is intentionally built to be modular and adjustable. In future iterations of the Sovereignty system we plan to refine the process for measuring activity, including expanding what kinds of activities are counted towards the bonuses. This new Sovereignty system will bring with it a new set of UI elements. We are currently working on a complete revamp of the Sovereignty dashboard to clearly show both individual systems and the status of all your Alliance’s Sovereignty structures. The following images are early mockups and will likely change significantly before the final release based on continued iteration and community feedback. This is an example of how the new system information panel on the top left hand side of the UI might look. It demonstrates a system in which each of the Sovereignty structures is owned by a different Alliance. The status and owner of each structure would be visible at all times here, and each element would be interactable to allow quick warping or aligning to each structure. This is an example of the new Sovereignty dashboard window displaying information on a specific star system. This page would show the position of the system within its constellation, the system indices, the status and owners of each Sovereignty structure as well as their occupancy defensive bonuses. This is an example of the new Sovereignty dashboard displaying information on an alliance level. This panel would only be available to members of the alliance, and could be potentially restricted by roles. Each Sovereignty structure belonging to the alliance would be visible here, with the ability to filter and sort by distance, type and status. With this panel, alliances will be able to keep track of the real-time status of their active Sovereignty capture events to direct their forces where they will be most needed. To illustrate how all of these elements come together, let’s walk through a hypothetical battle over the Sovereignty structures in a single Nullsec system. Let’s use the example of a fight in the RHG-4O constellation in Feythabolis. Blackhawk Alliance owns all 5 stations, as well as TCUs and IHubs in every system. A director in Blackhawk Alliance’s executor corp has set an alliance-wide primetime period to the 4 hour period of 18:00 – 22:00 EVE Time. This means that all of Blackhawk Alliance’s Sovereignty structures are only vulnerable to reinforcement between 18:00 and 22:00 each day. At other times attackers are free to disable station services but cannot reinforce the Sovereignty structures to capture or destroy them. A small gang from the Flameburst Coalition comes by one day at 19:30 and wants to reinforce the Sovereignty structures in the RIT-A7 system. They have one of their members equip an Entosis Link module from a Mobile Depot, and activate it on the station. When the first cycle of the Entosis Link completes, this triggers an alert for everyone in the system (including docked players) and the fact that the station is under attack is visible in a new Sov Structure system info panel on the right hand side of the screen. Blackhawk Alliance members with the correct roles also receive a notification letting them know about the attack. If members of Blackhawk Alliance (or their allies) are nearby they can undock and drive off the Flameburst Coalition attackers. The Flameburst member who is using the Entosis Link is especially vulnerable since he cannot warp or be remote repped while the Link is active. If the attackers are kiting 200km away and the Blackhawk members don’t want to chase them down, a Blackhawk Alliance member also would have the option of activating his own Entosis Link on the station to pause the progress of Flameburst’s attack and force them in. However for this example Blackhawk Alliance mostly lives far away and nobody is close enough to properly respond until it’s too late. Since RIT has mediocre system indexes, it receives a 2x defensive multiplier from occupancy. It therefore takes 20 minutes for the Flameburst gang to reinforce the station. Since Entosis Linking doesn’t scale with numbers, they wouldn’t have reinforced it any faster even if they had activated 100 links on the station. When the station enters reinforced, it picks a random time within the same 4 hour vulnerability window ~48 hours later (similar to the current station reinforcement mechanic) and displays that timer to everyone watching the station. In this case it picks 20:45. The Flameburst gang would then be free to keep roaming Blackhawk space and reinforce more structures (which would create their own separate random timers within the same 4 hour window). They decide to reinforce the TCU and IHub in RIT-A7, which create exit timers at 19:10 and 21:05 respectively. The occupancy defense bonuses for all of these structures lock while they are reinforced and will not be affected by changes in indices over the two days of reinforcement. This ensures that Blackhawk Alliance cannot grind themselves into better defense bonuses for the capture events. The occupancy bonus of 2x that existed when the Sovereignty structures began their reinforcement period will apply to the capture events as well. When the Sovereignty structures each exit their reinforcement timer, the capture events begins. For the purpose of the event, Blackhawk Alliance (the guys who own the structures) are Team A and literally anyone else in EVE are Team B. This means that although Blackhawk can feel free to call their friends to help them kill their opposing fleets, the actual capturing of the control points using the Entosis Link module only benefits the defenders if Blackhawk Alliance members are doing it. At 19:10 the capture event for the TCU begins, and five Command Node anomalies immediately spawn at random points in the constellation. For this example scenario we’ll say that the defenders from Blackhawk Alliance win that event quickly and easily, capturing 10 Command Nodes before a late Flameburst fleet arrives. This returns the TCU to an invulnerable state, but has no effect on the other two Sovereignty structures. Since each structure operates independently, each must be fought over independently. At 20:45 the Station capture event begins, spawning its own set of five Command Nodes at random points in the constellation. For our example scenario, the attackers from Flameburst Coalition have arrived in force at this point and outnumber the Blackhawk Alliance defenders. The Flameburst Coalition has a larger fleet, but Blackhawk Alliance does have the advantage of the 2x occupancy defense bonus. This means that the Blackhawk Alliance members capture Command Nodes in 10 minutes while Flamebust Coalition members (and anyone else showing up) require 20 minutes. The Blackhawk Alliance members can take advantage of this by staying mobile and hitting the weakest of the Flameburst Coalition squads. Since the Station capture event is not finished by 21:05, when the IHub event begins it becomes the second active capture event in the same constellation. This is perfectly fine, as any number of capture events can operate at the same time in the same constellation. The Command Nodes are clearly marked on the overview and scanner window to show which structure in which system they influence, and both sides are free to choose which events they wish to prioritize. 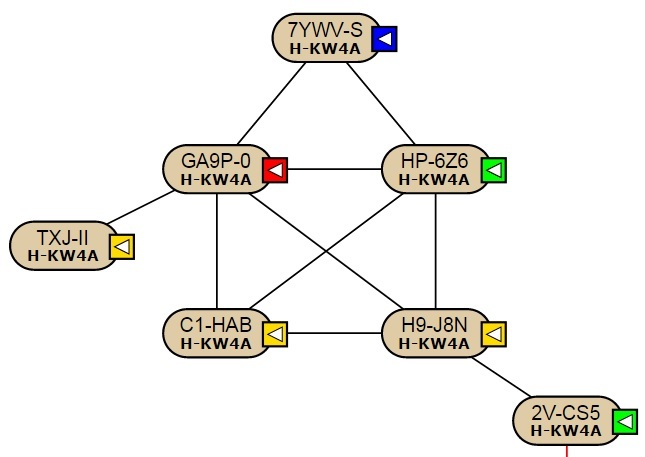 The status of the tug of war for each Sovereignty structure is clearly visible on the actual Command Nodes, as well as in the system info panel in RIT. Members of Blackhawk Alliance may also use their Alliance Sovereignty overview page in the Sovereignty dashboard to keep up to date on the real-time status of the capture events for each of their structures. The only way to determine which systems contain Command Nodes is to use active scouting. In our example case, let’s say Flameburst Coalition manages to catch the majority of the Blackhawk fleet in some bubbles and decimates their force, allowing them to win the first capture event for the RIT station and the capture event for the RIT IHub. The IHub explodes, allowing anyone to place a new replacement hub. On the other hand, the station goes into its 48 hour Freeport Mode. Everyone can freely dock in the station during this period, allowing Flameburst to more easily stage in the area. Members of Blackhawk Alliance start evacuating their most important assets to secure stations nearby just in case they lose the second timer. At the end of the Freeport Reinforcement Period the second sov capture event begins. This time every individual alliance is considered their own team for the tug of war, and any number of coalitions can compete for ownership of the station. Since the station has no owner, no occupancy defensive bonuses apply for this second event. Since everyone can also dock in the station before and during this event, it becomes much harder to control the area. If members of any two alliances at all have Entosis Links active on the same Command Node during this second event, the capture progress will be paused. Whenever any alliance captures a Command Node anomaly, they gain points while also removing points from every other alliance with a current score. The second event ends when any one alliance (which could include Blackhawk Alliance taking back their station, Flameburst Coalition winning the system or Dragon Fleet swooping in to surprise them both) manages to win the multi-side tug of war. If an alliance wants to support an ally instead of capturing the station for themselves, they can do so by shooting enemy ships and leaving the actual Linking to the ally they are trying to support. If there are only two sides attempting the actual Linking, then this event will work just like the first capture event with a simple two sided tug of war. If more than two sides are all competing for the station, it would be expected that temp-alliances may form between losing groups against the group that is currently winning (they can easily work together for short times by simply agreeing to hit different Command Nodes until their targeted opponent has fallen behind). In this example the surprise attack from Dragon Fleet is effective, as they are able to break the will of both the Blackhawk and Flameburst fleets and take the station. We hope that this blog has made the designs behind the new Sovereignty system clear, and given you a good glimpse into how these updates would change life for all players living in Sovereignty Nullsec space. Sovereignty is a huge priority for CCP in our plans for 2015 and we are not going to hold back when it comes to making bold changes to the Nullsec landscape. As I mentioned at the beginning of the blog, we are now entering a significant period of public feedback on these designs and we absolutely encourage our whole community to share with us your feedback in as much detail as possible. The comments thread for this blog will be an excellent place to share your opinions with us, and we will be reading it carefully. We will also be discussing all of these changes with you at Fanfest, which will include presentations and roundtables on the ongoing plans to revamp Nullsec. This new Sovereignty system is currently scheduled for release in June of 2015, which we believe gives us enough time to refine these designs and incorporate the best community feedback. If we decide that another release date is preferable however we won’t hesitate to make use of our rapid release cadence to move these changes to the date that fits them best. I’ll leave you now with a flow chart that summarizes the new system of Sovereignty structure reinforcement, capture and destruction. It’s the counterpart to the now-famous image released with the Dominion announcement blog more than five years ago and kicked off the Dominion Sov that’s being replaced this Summer. Thanks for taking the time to read this massive blog, and good hunting! -CCP Fozzie, on behalf of Team Five 0 and the whole EVE Game Design team. New to EVE? Start your 30-day free trial today. Buy Plex, Starter Kits, Addons and more at Markee Dragon Game Codes! Final Fantasy XIV:PlayStation®4 Upgrade Campaign Ending Soon!